When it comes to electric toothbrushes, the desired option for some time has been the Phillips Sonicare line of brushes. Today we’re comparing Philips Sonicare 2 Series vs 3 Series to show you what they have in common and what advantages and potential drawbacks each possesses. Read on and find out more! The 2 Series doesn't have a traveling case. The Sonicare 2 series and 3 series from Phillips do share a lot in common when it comes to their features. As they are from the same line of brushes. Both brushes give users the chance to have a great clean, have good handles, and utilize technology. They both make 31000 brush strokes per minute, like Sonicare models. They both remove plaque six times better than a manual brush. However, the 3 Series has a special brush head that removes plaque from under the gum line. They both come with a two years manufacturers warranty and ninety days money back guaranty in case you are not happy. They both have dual voltage capability; you can charge them in USA sockets and internationally where the voltage is 240V. They both have smart-timers and easy start functionality (slowly increases the power after 14 uses). They are both durable. Most people who have bought any of these two say they’ve had them for several years. They both have easy snap-on design and blue bristle reminders that fade into white when its time to replace the brush head. They are both safe to use on veneers, orthodontics, implants and any dental work. 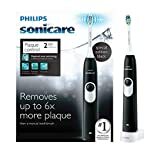 Philips sonicare – 3 series gum health brush heads and 2 Series are relatively smallish in size – approximately 50% the size of usual brush heads. Th brush heads are called ProResults. The only difference is that the Sonicare 2 Series is designed for ultimate plaque removal and are called ProResults Plaque control while the 3 Series brush head called ProResults gum health is designed for detailed gum care. As you can see, the variety of settings and features make them a good option for most, but when it comes to more features offered, Sonicare 3 wins. The 3 series has three intensity settings and more that give users wide options when it comes to brushing. However, you will have to pay more for those features as they do come at a cost. The Sonicare 2 Series is slightly more affordable than the 3 Series. While both have great advantages to them, they, unfortunately, do not come with the new Bluetooth that many high end brushes have including those for young ones. The Sonicare 2 and 3 both feature handles that are fairly typical of a power toothbrush; elegant and minimal buttons. 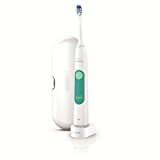 The Philips 2 Series model has only the power button on the front, but the Sonicare 3 Series comes with an LED light below the power button that shows you the status of the battery and allows you to pick different modes. While the Sonicare 2 comes in six different color options, the Sonicare 3 has only one color option available. Bad news for those who like color, but the 2 Series might be for you if you really care about colors and customization. There are of course a few differences between the 3 Series vs series 2 that you’ll be interested to find out– and may even help you decide which model you might like. The 2 Series is clearly designed to target plaque and plaque control is the name of the game for this model. It has a brush head called ProResults Plaque Control that are designed to remove maximum plaque from hidden areas. The power and efficiency of the Sonicare 2 make it uniquely capable of removing plaque using its 31,000 brush strokes a minute that make it up to six times better at removing plaque than a manual brush. It has curved bristles in long tufts that mimic the shape of your teeth. The Essence Plus is a base sonic toothbrush that is good to transition from manual to a power toothbrush. It comes with a SimplyClean brush head that remove three times more plaque than a manual brush. Meanwhile the 2 series has a ProResults brush head that removes 6 times more plaque than a manual toothbrush. The Sonicare 3 is designed to help users maintain their gum health with a special brush head (ProResults gum health) that was designed to remove plaque from along the gum lines. The 3 Series brush has way more features than the 2 Sonicare model could ever hope to have and also has the same amount of power as the 2 had but with way more features that allow users to customize their brushing experience or session that day. What about Philips sonicare series 3 vs diamondclean? Well, the Diamondclean has more cleaning modes, a better traveling charger, comes with more than one brush head especially the new smart series 9500 and 9700 that have five and seven brush heads respectively. The Sonicare 2 comes with a timer that allows you to brush for the two minutes recommended by dentists. However other than that it really is a standard electric brush even if it does remove up to six times more plaque than a manual. The 3 Series comes with three intensity settings (low, medium and high) so you can set it to whatever setting is best for you. It has the same timers as the 2 but also comes with the Quadpacer feature, which notifies users that it’s time to brush a different section of the mouth using vibration. The 3 also has a more powerful battery (Lithium ion batteries that can last between 5-15 years depending on care and usage) where the 2 has the NiMH battery, so it’s going to last longer in general but its not as powerful as the Lithium ion battery. It can be used on sensitive teeth because it has three settings, for sensitive teeth start with low setting and work your way up. The brush head of 3 Series is cup shaped and has a small footprint foe easy manueverability and to thoroughly clean under the gums. It also allows you to focus of brushing one teeth at a time in detail. The 3 Sonicare Series comes with a hard travelling case for effortless storage when travelling. The 2 Series doesn’t have a travelling case. Once you have sorted out your plaque and gums using sonicare 2 vs 3, which in all aspect are the foundations of healthy teeth, you can then shift gears up and work on whitening your teeth while maintaining your gums in peak condition by getting the sonicare series 5 also called HealthyWhite. Should you get the Sonicare 2 or the Sonicare 3? In the end, it comes down to preference. Maybe you want something better than a manual but don’t need all the bells and whistles. In that case, you’d want the Sonicare 2. Or you want something that can help you with the plaque below the gums and has a few neat features– that would be the Sonicare 3. You really cannot go wrong with either brush but check these two models out online and see what you think! Either choice is a good one when it comes to the Sonicare line.